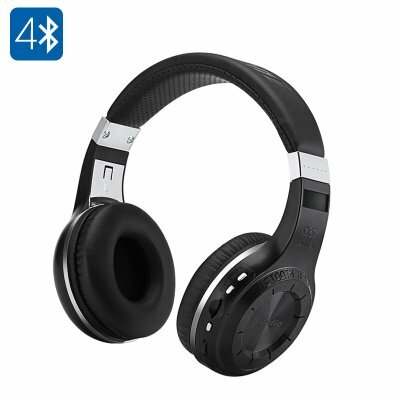 Successfully Added Bluedio H+ Bluetooth Headphones - Bluetooth 4.1, 16 Ohm, Build In Battery, A2DP, AVRCP, HSP, HFP, Micros SD, FM Radio to your Shopping Cart. The Bluedio H+ Bluetooth headphones offer high fidelity audio with no cables attached. You can sync these headphones to your computer, Smartphone, stereo, tablet and just about any other Bluetooth devices and listen to music up to 10 meters away. This allows you the freedom to listen unimpeded without being tethered to one spot letting you get on with anything else you may be doing, whether that's dancing the night away, cooking dinner or commuting to work. In case you want to use them with a non Bluetooth enabled device you can always uses the 3.5mm audio cable that accompanies these headphones. These headphones are so light at just 200 grams and the soft padding along with adjustable headband makes them so comfy to wear that you will hardly notice your have them on, when they're not in use that is. However just connect to you Smartphone or play music from the SD card and the two 57mm drivers will offer up some thumping base with a well balanced sound that's sure to win over any audiophiles as it lets you enjoy the tiniest of details in a track. Don't let the price of these headphones fool you, while they may come in at the lower end of the headphone spectrum in cost this wireless headset only offers awesome hi-fidelity audio and with Bluetooth 4.1 you get a stronger more stable connection that reduces noise and interference. When synced to your phone the Bluedio H+ headset can be used to accept incoming calls so you won't miss any important or urgent calls again. The Bluedio H+ Bluetooth headphones comes with a 12 months warranty, brought to you by the leader in electronic devices as well as wholesale Wireless Headphones and audio gadgets..